In 2006 Miami Heat coach and president, Pat Riley, built a team around Dwyane Wade and Shaquille O’Neal to capture the championship he had waited to experience for 11 years as the leader of the team. 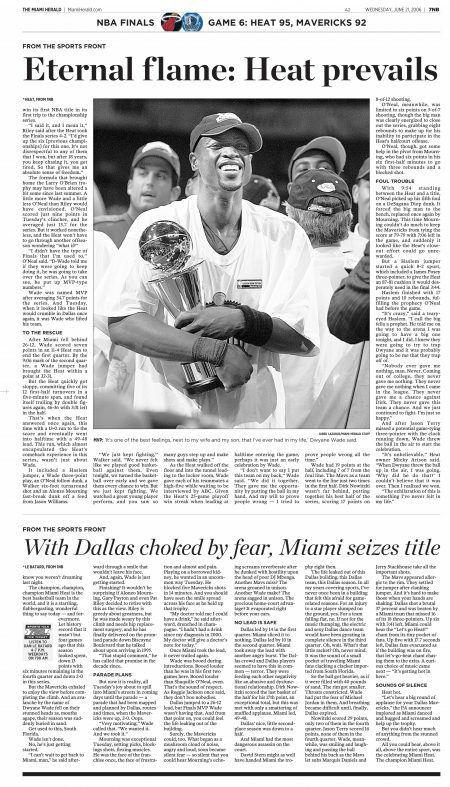 Miami trailed the Dallas Mavericks by two games and faced a 13-point lead in the closing minutes of Game 3 before rallying for the victory. 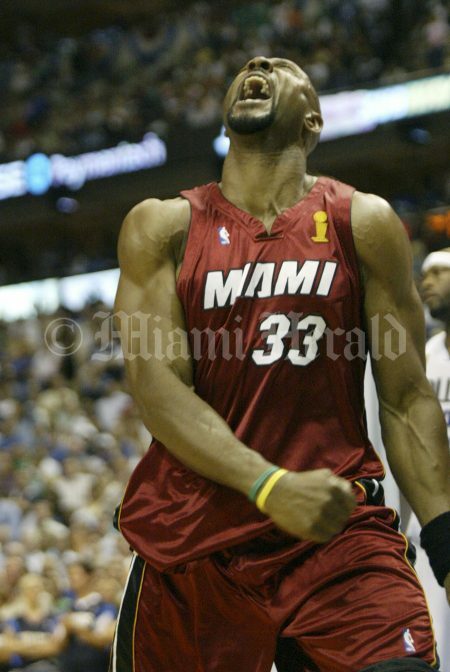 The final score of the series was Miami 95, Dallas 92. 6/20/2006, C.W.Griffin/Miami Herald Staff: Dallas - Miami Heat vs. Dallas Mavericks in Game 5 of the NBA finals Tuesday, June 20, 2006, at the American Airlines Center in Dallas. 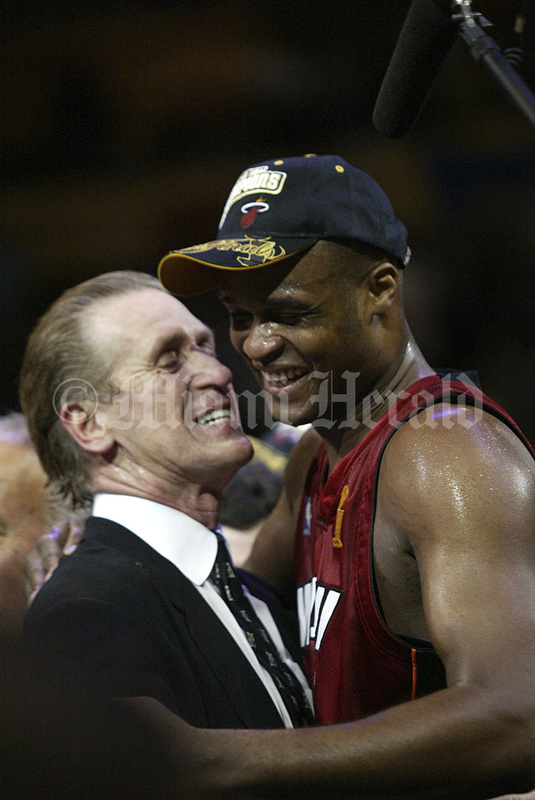 Antoine Walker and Pat Riley hug after the game. 6/15/06, Charles Trainor Jr./Miami Herald: NBA FINALS GAME 4 MIAMI HEAT VS DALLAS MAVERICKS --- Actor David Hasselhoff picture was a tool to taunt Dirk Nowitzki. 6/20/2006, C.W.Griffin/Miami Herald Staff: Dallas - Miami Heat vs. Dallas Mavericks in Game 5 of the NBA finals Tuesday, June 20, 2006, at the American Airlines Center in Dallas. 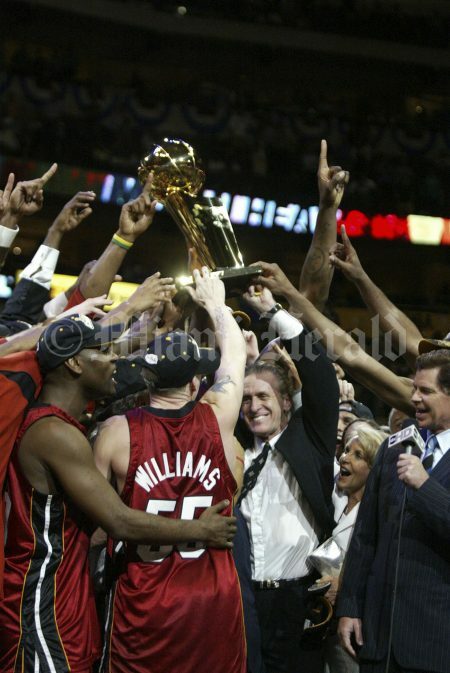 Heat coach Pat Riley celebrates with his team after the win. 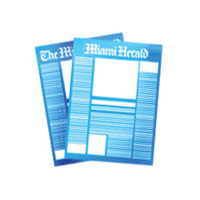 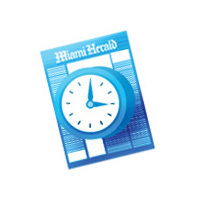 06/21/2006,Nuri Vallbona/Miami Herald: MIami Heat fans cheer as they drive down Biscayne Blvd. after the Heat defeated the Dallas Mavericks to clinch the NBA Finals Tuesday. 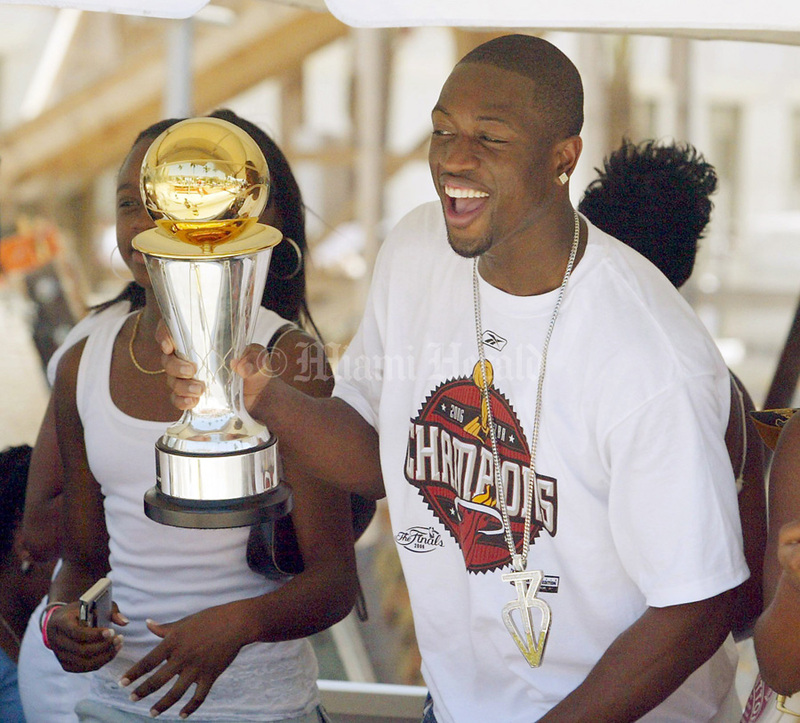 6/23/2006, Hector Gabino/ El Nuevo Herald: Miami Heat Dwayne Wade Showing his MVP throphie to all his fans during The Miami Heat 2006 NBA Championship parade in downtown Miami. 6/18/06, Charles Trainor Jr./Miami Herald: MIAMI HEAT VS DALLAS MAVERICKS GAME 5 NBA FINALS - Joanna Ledes of Miami shows her support for the Miami Heat with her choice of socks outside the AAA before game 5. 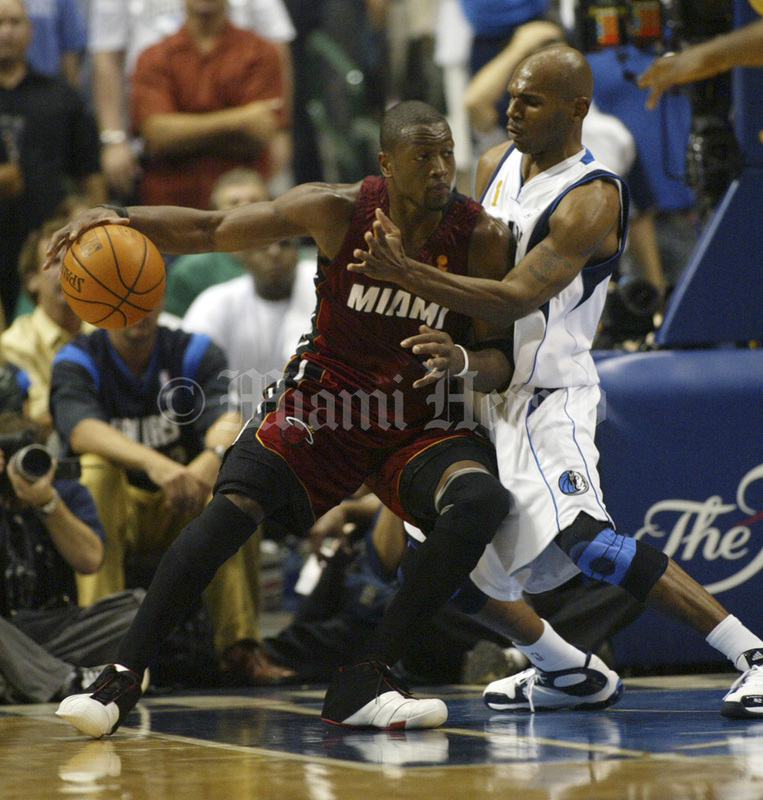 6/20/2006, Jared Lazarus/Miami Herald: MIAMI HEAT VS. DALLAS MAVERICKS, GAME 6 NBA FINALS -- MIAMI HERALD STAFF PHOTO BY JARED LAZARUS -- The Miami Heat play the Dallas Mavericks in game SIX of the NBA Finals, Tuesday night, June 20, 2006 at American Airlines Center in Dallas, Texas. 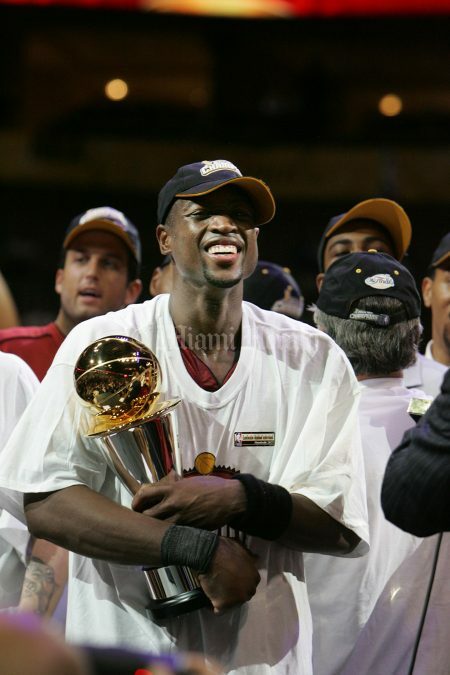 Dwyane Wade hugs the MVP trophy after the Heat defeated the Mavericks to win the NBA Championship. 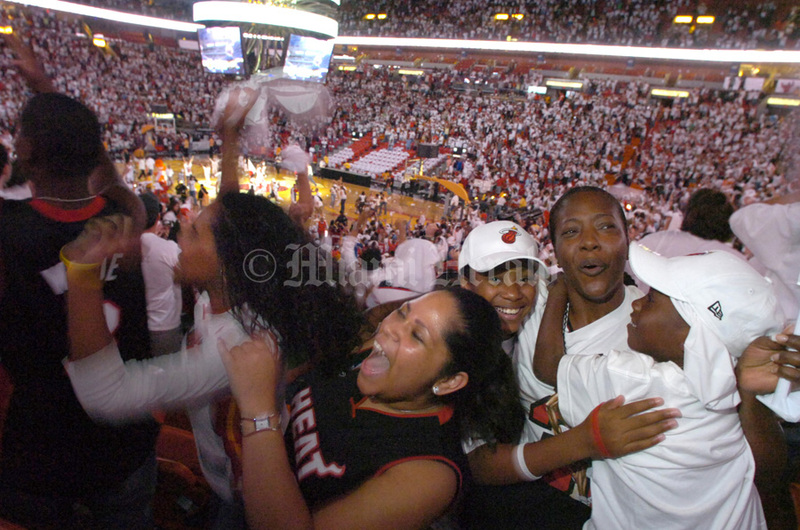 6/20/2006--Marice Cohn Band/Miami Herald: Miami Heat fans cheer their team on during a special event at the American Airlines Arena in Game 6 of the playoffs against the Mavericks (in Dallas). 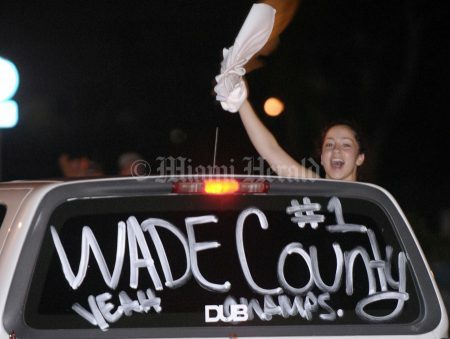 Here, Princess McCoy, of Ft. Lauderdale, shows her spirit. 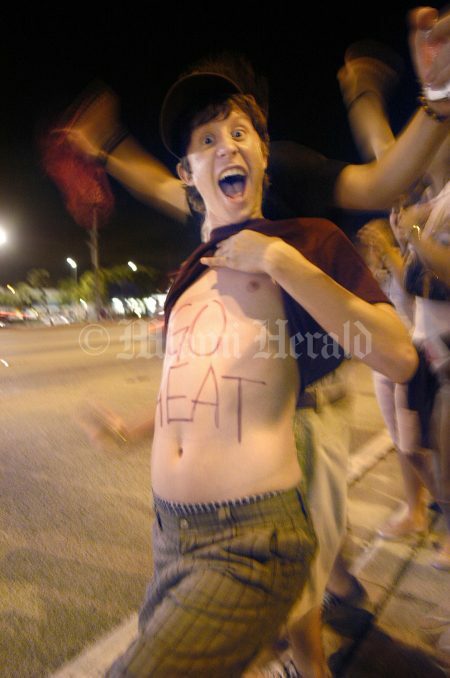 6/21/2006, David Adame/Miami Herald: Miami Heat fans take to the streets to celebrate their team's first NBA championship early Wednesday morning June 21, 2006 in Hialeah, Fl. 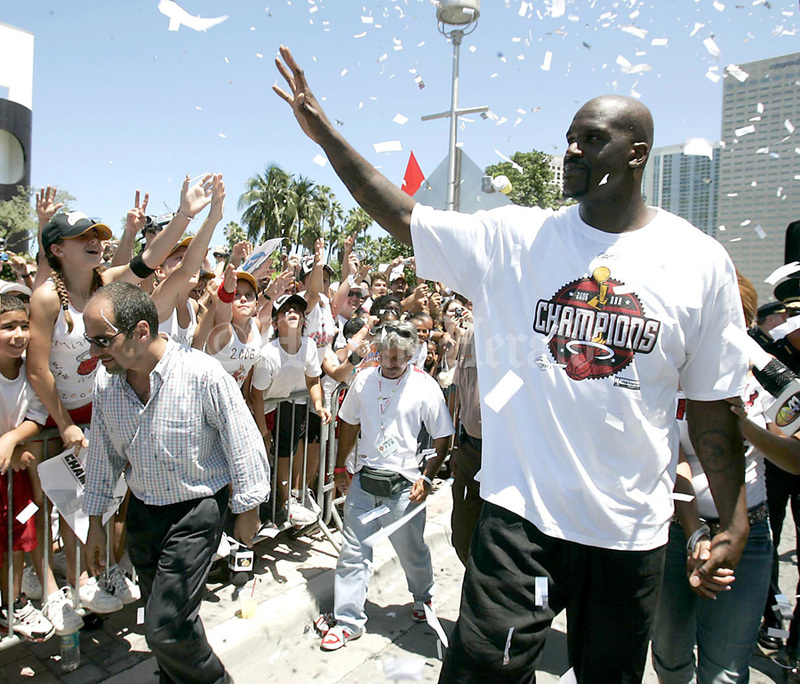 6/23/2006, Hector Gabino/ El Nuevo Herald: Miami Heat Shaquille O'Neal giving high five to all his fans during The Miami Heat 2006 NBA Championship parade in downtown . 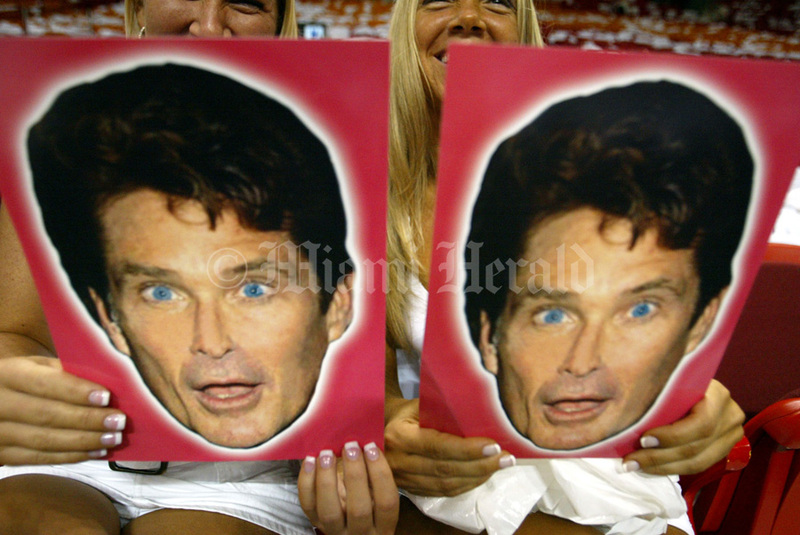 6/20/2006, C.W.Griffin/Miami Herald Staff: Dallas - Miami Heat vs. Dallas Mavericks in Game 5 of the NBA finals Tuesday, June 20, 2006, at the American Airlines Center in Dallas. Heat's Alonzo Mourning reacts to making a basket during the third quarter. 6/20/2006, Jared Lazarus/Miami Herald: MIAMI HEAT VS. DALLAS MAVERICKS, GAME 6 NBA FINALS -- MIAMI HERALD STAFF PHOTO BY JARED LAZARUS -- The Miami Heat play the Dallas Mavericks in game SIX of the NBA Finals, Tuesday night, June 20, 2006 at American Airlines Center in Dallas, Texas. 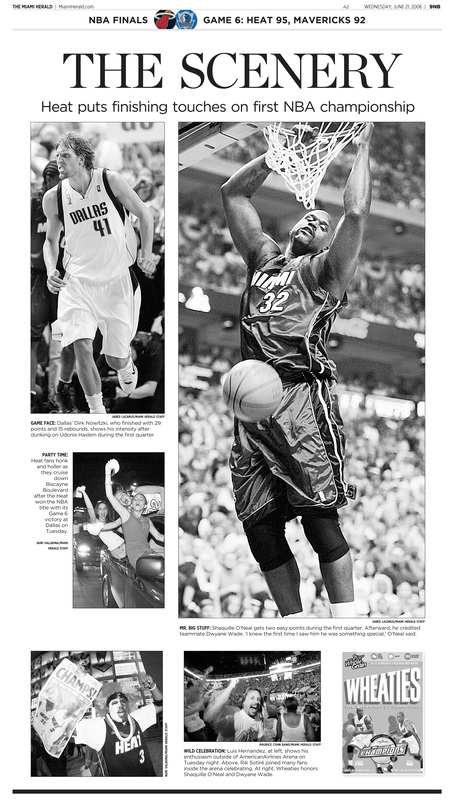 Shaquile O'Neal gets a good look at the basket as Dallas' DeSagna Diop defends in the second quarter. 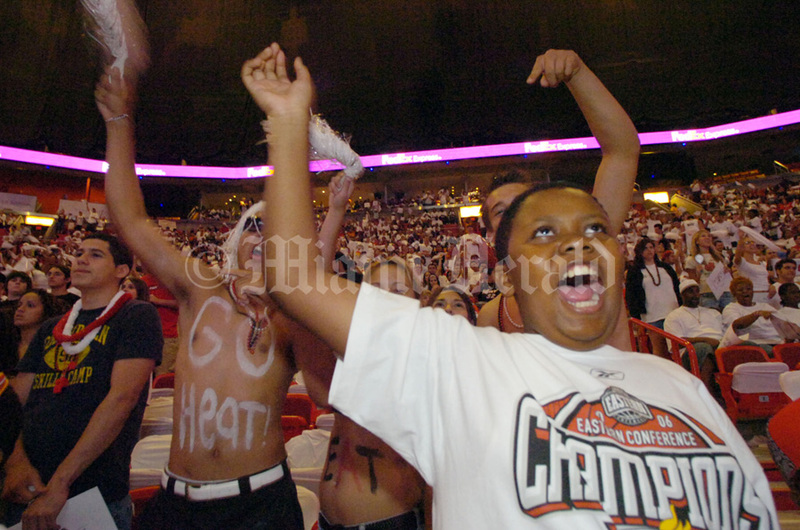 6/20/2006--Marice Cohn Band/Miami Herald: Heat fans, at the American Airlines Arena, go crazy when they win the championship. Eunice Lightburn, center, wearing Heat jersey, and Danielle Chung, on the left, both 22, and from Kendall, rejoice with the win. 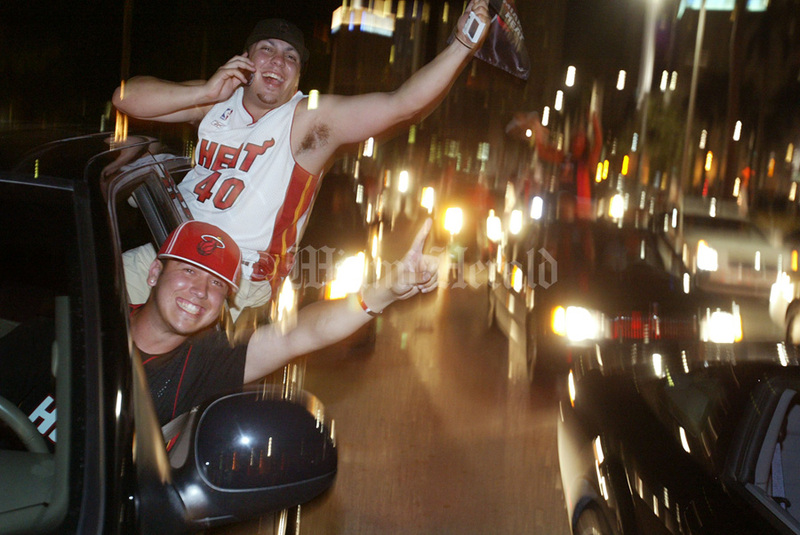 06/21/2006,Nuri Vallbona/Miami Herald: Carlos de la Osa (back) cheers for the Miami Heat as he and a buddy parade down Biscayne Blvd. 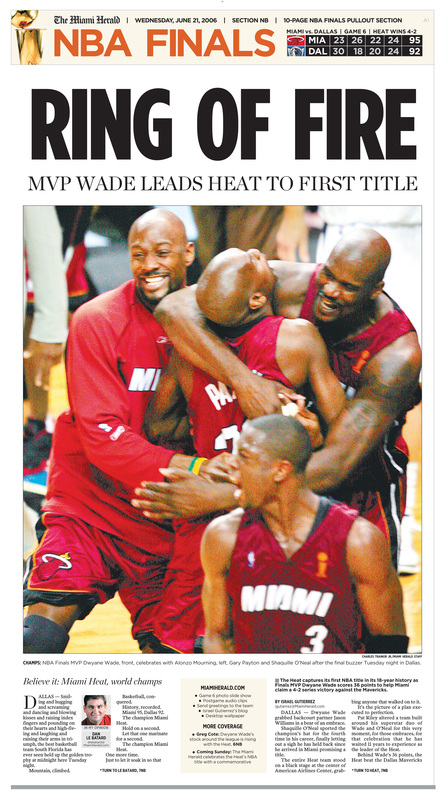 after they defeated the Dallas Mavericks in the NBA Finals. 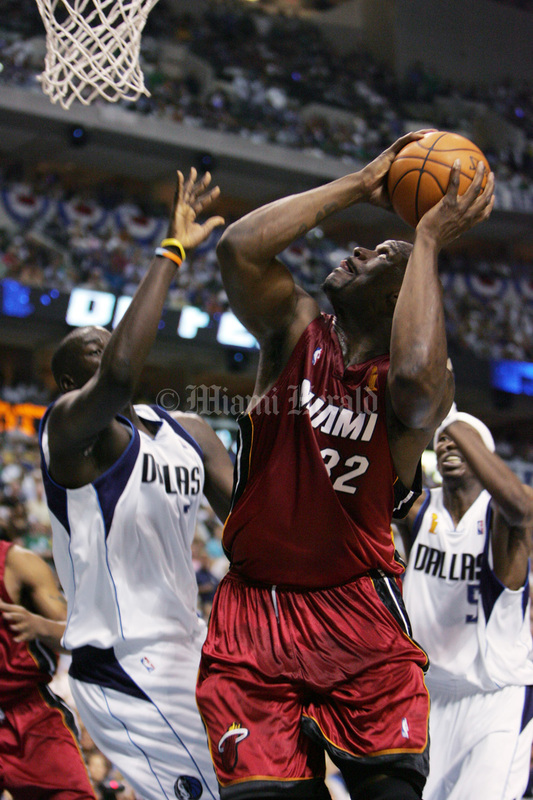 6/20/2006, C.W.Griffin/Miami Herald Staff: Dallas - Miami Heat vs. Dallas Mavericks in Game 5 of the NBA finals Tuesday, June 20, 2006, at the American Airlines Center in Dallas. Mavericks' Jerry Stackhouse guards Heat's Dwyane Wade during the second quarter. 6/21/2006, Gaston De Cardenas/El Nuevo Herald: Miami Heat fans drive through the streets as they celebrate their teams NBA title after the Heat beat the Dallas Mavericks June 21, 2006 in Miami, Florida. 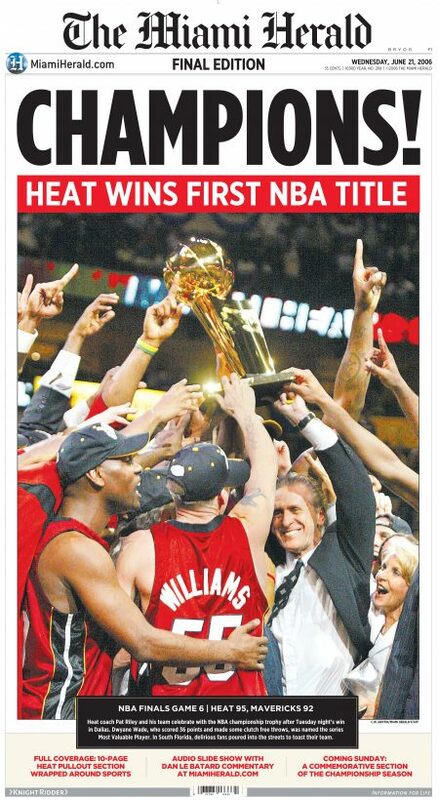 The Heat won the game and the championship for the first time in team history.